We woke up today to this magical sight. Some people moan and groan about winter, but I love it. Granted, I am a total chicken about driving in the ice and snow. So I just stay home and keep the fire burning while other more macho souls go out and run the errands. It's a good time to cook, or snuggle under the covers with a book. There is nothing better than looking out through a frosted window from my warm nest to see white white white everywhere. 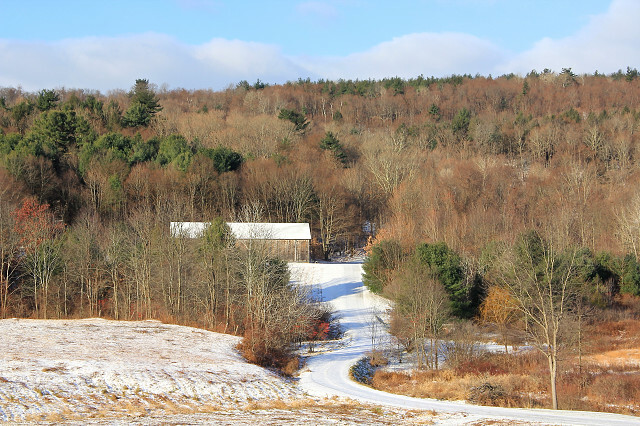 The snow highlights the beautiful bare bones of the land. Thanksgiving is coming up this week, so I am scribbling menus and recipes. This US holiday is all about the food. We work for days to put it all together, then we sit and gobble up everything in about twenty minutes. It's truly amazing. I think a lot of my Mom and Dad this time of year. And the eating contests that the men used to have when I was a little girl. They would stuff themselves silly, then they'd all lie down on the floor to recuperate while we girls tiptoed around them to clear the table. My father and my uncle would be out cold, snoring. We kids thought it was SO funny! There is a bush down by the stream in the center of this picture that has lovely red berries on it. Think I'll harvest some branches and make a centerpiece for the table. They should be pretty with some evergreen boughs.